We have been established in Shrewsbury since 1970 and have developed with a long-standing reputation for excellent teaching and well-rounded, balanced students. We are proud of the welcoming and friendly atmosphere in our club - it is important to us. We are a traditional karate club. This means that as well as learning physical self-defence techniques we also nurture good character and respectful behaviour. The style of karate we practice at the club is called Shito-ryu. This is one of the four traditional styles of karate. Our Club Chief Instructor is Chris Mileham Sensei, 7th Dan. Sensei Chris Mileham has 40 years of teaching experience and was graded to the rank of 7th Dan (7th degree black belt) by Soke Yamada Haruyoshi 10th Dan who is the President and Chief Instructor of the Yamada-ha World Shitoryu Shukokai Union. Sensei Chris Mileham is also one of the four co-founders of The Shropshire Karate Masters Association. This pioneering collaboration of senior instructors is dedicated to the advancement and teaching of authentic Japanese karate. It has been established to enable the students of traditional karate to benefit from the wealth of knowledge and experience of Shropshire's foremost karate instructors. We are members of this worldwide association whose philosophy is for karate clubs to train together collaboratively to preserve the traditions of karate while keeping pace with the modern evolution and improvement of this martial art. The Technical Director of the SSWU is Sensei Masataka Ohshita 9th Dan Soke Hanshi. Our membership gives us direct access to the teachings of the original karate masters of Okinawa and Japan. Sensei Chris Mileham travels regularly to Europe and Japan to train with Sensei Ohshita and other highly respected teachers. Students also have the opportunity to train with these teachers when they travel to England to give seminars. And for the more dedicated, there is even the opportunity to travel to Europe and Japan to train as well. Sensei Chris Mileham is Vice-President of the Directory Committee of the SSWU and also the National Co-ordinator for other UK karate groups with membership of the SSWU. For more information about the SSWU, follow our 'Links' (see below). We have a well structured and successful syllabus that guides students through from white belt beginner to their first black belt and beyond. 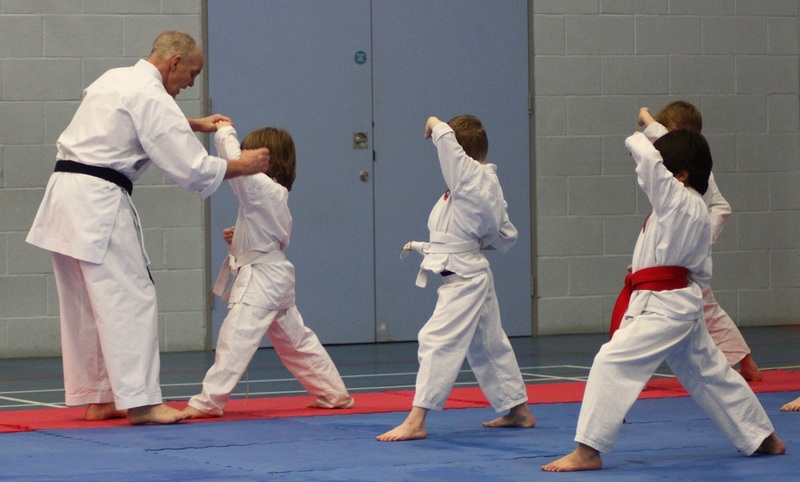 There are regular exams (called 'gradings') to enable continuous progress. Students are guided and encouraged every step of the way. They are able to take their gradings at the club as Sensei Chris Mileham is a qualified Grading Officer, officially authorised to supervise karate examinations. Sensei Chris Mileham is also the Dan Grading Officer for Shukokai England and is a member of the SSWU International Dan Grading Panel. Many of our students enjoy the challenge of competition and we encourage them in this area with specialist squad training sessions. We are proud to have achieved many national and international successes. Sensei Chris Mileham has had a successful competition career having represented Great Britain in team kata at the WKF World Championships and the SKU England team at many international tournaments. He was the English Karate Board All Styles National Kumite Champion and also the Shukokai Karate Union National Kata Champion and National Kumite Champion several times. He has coached students to national and international success and qualified as a British Karate Federation Referee.